... this is what your week feels like. 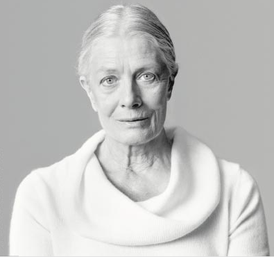 This is Vanessa Redgrave. Tomorrow night, she opens on Broadway in a one-woman show, portraying Joan Didion in a staged drama of Didion's The Year of Magical Thinking. I saw the show last week. If you know you will be anywhere near Manhattan in the next several months, do yourself a favor and order a ticket immediately. The play is based on Didion's memoir of the year her husband died and her daughter fell gravely ill. It is a sad story, yes, but in Didion's hands, it is the story of how a thinking, feeling human being manages to get through tragedy with insight and wisdom. It is also a celebration of an amazing relationship. Didion is one of the great literary voices of our time, and Vanessa Redgrave one of the greatest actresses. The play will move you and mesmerize you. I promise. This weekend I went to the Black Party, a very X-rated gay dance event with a heavy leather theme. The Black Party has been held annually for 27 years and is a certified New York City institution. Fortunately for some and unfortunately for others, I will spare all details of the night … because this is a family-friendly blog. Going to the Black Party reminded me how great it is to have recurring gatherings in your life – events that let you check in with who you were, see what you've become, and feel great about where you're going. I talked and danced with friends from every stage of my New York life, and left the party full of great memories of 20+ years in The City. When I moved here in 1984, I rented my first apartment in the far West Village. It was a two-bedroom with river view, as well as a straight shot of the crumbling Christopher Street Pier. It cost $781/month. I was pretty much "in the closet" at the time. I sublet my apartment from a gay gay gay Canadian guy whose work visa had expired, forcing him to head back to Montreal. When he called to tell me that I could have the place, he said there was just one condition. Me: Sure, what’s the condition? He: I’d like to be able to stay here two weekends a year. He: Black Party and White Party. Me: (puzzled) Absolutely. Just say when. I had no idea what these parties were, and I was too stupid to ask if I could tag along. When the Black Party came, he showed up, said hello, headed off to The Saint at midnight on Saturday, and didn’t return before I headed to work Monday morning. Then he was gone. I have no idea if my long-ago Canadian landlord is still around or was present this weekend. I hope he was. And I hope that you have recurring events in your life that let you check in with your past. They're a very special kind of journey. In the annals of airline history, no decision has been more important for flyers than the one banning cigarette smoking in flight. It is hard to believe that for years passengers could light up while their neighbors were stuck inhaling secondhand smoke for hours at a time. 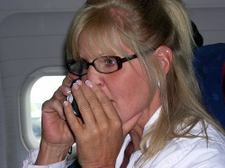 Yesterday, in one of those amazing moments when the government makes the right call, the FCC said "No" to the possibility of allowing cell phone use in flight. While the decision was based on technical concerns, the truth is that permitting cell phone use would have caused a huge uproar. In fact, it was a large public outcry over the past couple of years that helped seal this decision. Thanks to Paul for the tip-off to this fabulous news. Lesbian or Housewife? Depends on The View. Today I joined a pride of lesbians and a gaggle of housewives at a taping of The View. Why? Because my friend Gina (a lesbian) was visiting from San Francisco and because my friend Bob (not a lesbian or a housewife) works at ABC and got us tickets. Our timing was a little crummy, since we just missed Rosie's birthday bash (yesterday) and guest host Audra McDonald (on Tuesday). Today? We got Don Cheadle. In reality, though, the draw of The View is the hosts, and they were all in great form. My personal highlight was seeing BaBa WaWa in the flesh. She is pretty amazing, and looks mahvelous, as always. 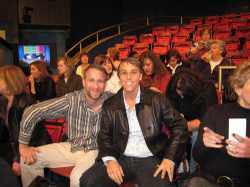 Everyone loves visiting a TV set. When you take in The View, chances are that "everyone" will include not only lesbians and housewives, but also by a small smattering of gay men. Of those gays, I was the thinnest. Thanks Rosie, Babs, Joy, Elizabeth, Bob and Gina ... for making my day. When I was a kid growing up in St. Louis, one of my favorite things was to sit at the end of the runway at Lambert St. Louis Airport and watch planes take off and land. I was an airplane geek from the beginning. Yesterday, the "Super Jumbo" A380 showed itself off to the U.S. with landings at JFK and LAX. The craft has been a slow starter on the financial front for Airbus. But who cares? 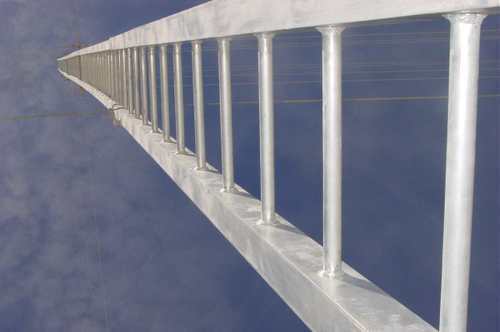 I can't wait to see it fly. Here's a preview, shot yesterday at LAX. 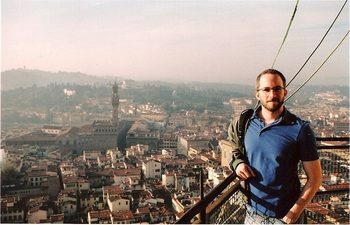 Yesterday's post featured me standing on an overlook high above Firenze. 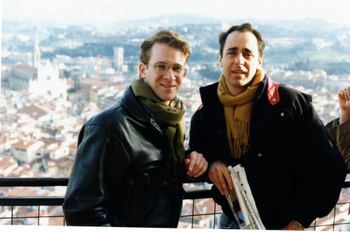 Today, I present a shot of recent Upright & Stowed convert Curtis, on the same overlook high above Firenze. It took Curtis something like 15 years to get where I'd already been .... but then again, he's something like 15 years younger than I am. Have you been on this same spot? If so, send proof. For three years in the early 90s I dated an Italian uomo named Marcello. He was (and still is) a flight attendant for Alitalia. Marcello and I traveled to all sorts of amazing places together. Here we are in Florence (Firenze to you). During those years we had a lot of fun ... and a lot of fights. In addition to being my "life partner" for three years, Marcello was also a bit of a germ freak. He stayed in hotels constantly (of course) and refused to let me walk around in my bare feet in any hotel room, no matter how many stars. He also had a thing about bedspreads, and the first thing he did when arriving in his hotel room was rip the comforter OFF the bed and put it in a corner. I absorbed these neuroses from Marcello, and I've become very 'other-people's-dirt'-sensitive in my own right. The truth is, Marcello knew what he was talking about. Proving this fact, the current issue of Conde Nast Traveler features an article on the dirt and germs that live in the typical hotel room, highlighting where they are most plentiful. Read it if you dare. Go Marcello! It was 70-something and summery this week in New York City. Yet today, we find ourselves covered in a blanket of snow and ice that is truly treacherous, though kind of beautiful. Not a good day to be traveling. A few weeks ago I was reading the Brown Alumni Monthly, my alma mater's relatively interesting magazine. What made my heart skip a beat was the photo above. 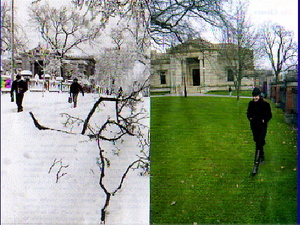 It was a comment on global warming, and the caption explained that this was two views of the same spot on campus, one taken on Dec 6, 1981 and the other in Dec 6, 2006. Guess what happened on Dec 6, 1981? I turned 21! And this was the snowfall that welcomed that auspicious day. I feel lucky that a lot of people with whom I shared that day (and snowfall) are still in my life. And even though it's nasty outside, I'm glad that it is still possible to get a dose of snow, despite global warming. Urban living blog Gridskipper asked several (supposed) experts on architecture to name the ugliest buildings in New York City. Lord knows this town is full of ugly buildings. But I was of shocked to read one of their panel members calling the fabulous new Hearst Building the city's ugliest. Alas.... there's no accounting for taste. I think the Hearst Building rocks, and I said so here. My vote for the ugliest eyesore of a skyscraper? It ain't even built yet, but it's coming. And, believe me, there's going to be no escaping its big arrogant ugliness. 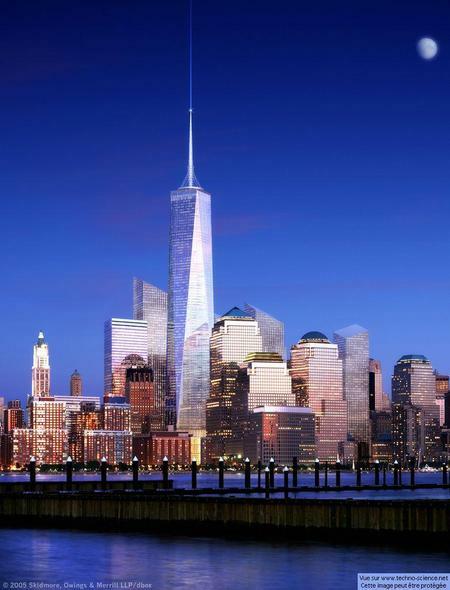 They call it "The Freedom Tower." I call it "The Ugly Side of Freedom."